It has been a big few days for Ballymore Stables, winners in Australia and New Zealand including one of the feature events at Australia's most famous provincial carnival - the $150,000 Listed Wangoom Handicap at Warrnambool. Striking heavy going for the first time in his 19 start career, the talented five-year-old Yesterday's Songs put in the sort of finishing burst we have always known him to be capable of, getting up along the rails and quickly putting his pay to his rivals. Saluting by a length, Yesterday's Songs - superbly ridden by James Winks - recorded his fifth victory, increasing his prize money tally to $274, 680. "That was a particuarly satisfying victory," said Michael Moroney who has always been a big fan of the son of Henrythenavigator who has been plagued with problems throughout his career... "knees, feet, the works!" The cut out of the track was always going to suit Yesterday's Songs and he relished the conditions - much to the joy of a large group of owners on course to cheer their hero home. And hopefully there is more to come with a Queensland campaign being considered for the classy gelding. We were again in the winner's circle at Bendigo on Friday with debutant Barthelona charging home to record a narrow but gutsy win in the 1100m 2Y0 maiden. Getting back from a tricky gate, the son of Zoffany gained a split into the straight, racing greenly but really charging late to secure victory right on the line. "He is a nice colt who was showing a fair bit early," Moroney reported. "He won a jump-out here before Christmas and we sent him up to Sydney for the Inglis Class but he went off his food and started to grow so we gave him a bit of time." Purchased by Paul Moroney (for whom Yesterday's Songs was the 110th individual stakes winner he has bought) at last year's Inglis Classic Sale, Barthelona is a half-brother to the dual stakes winner Under The Louvre out of Barcelona Girl, an unraced half-sister to the Group Two winner Master Harry. We are looking for the winning run to continue over the weekend with the promising Power Of Patch a leading contender in the More Than Ready Handicap at Rosehill. A gallant on pace second at Randwick on Anzac Day, the son of High Chaparral is suited up to 1900m with Christian Reith again taking the ride. "He has struck a strong race with a lot of horses - including him - on trial for Queensland. But we expect him to run well, he is a really nice staying horse in the making." On Monday at Kilmore we saddle up two runners kicking off with Elite Rock who takes her place in the 1900m maiden with Chris Symons to ride. 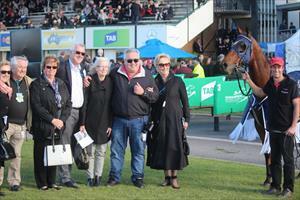 "She looks as though she wants to stay," Moroney said of the well related daughter of Fastnet Rock. "She has not always been the easiest horse to train but she is going well at the moment and whilst it is a strong maiden she should prove competitive." A couple of races later we have Bonnie Belle second up in the Darebin RSL Handicap with Anthony Boyd to ride. Suited up to 1450m after a good first up run, the Keeper mare looks very well placed. "She has a tricky gate (11) but she has improved a lot since resuming and with any luck in running she should prove very hard to toss." On Tuesday we take the enigmatic Rising Stock to Geelong. A horse who can do a few funny things he has however been an honest performer and he was a very good on pace third at Bendigo last time out. "He just has to put his right hoof forward to prove hard to beat," said Moroney.